Verichek Technical Services, Inc. is dedicated to serving the analytical needs of the metals industry by supplying metal analyzing spectrometers and servicing the equipment throughout the United States and Canada. The past year has seen a substantial increase in Verichek’s dedicated, enthusiastic and highly trained staff and business, leading to a move to a new main office and warehouse in Bethel Park Industrial Park, Bethel Park, Pennsylvania. Peruse our inventory of Spectro Instrument small parts. We have what you need for your instruments! Stay tuned as we are continuing to update our offerings to include small parts fo Oxford Instruments as well. Verichek’s service department is certified to the ISO/IEC 17025:2005 quality system and provides customer’s with periodic-maintenance (PM)/Calibration services, OES emergency repair, training, and instrument upgrade services. In addition, Verichek provides both on-site and in-house Positive Metal Identification (PMI), sorting grade-type as well as providing metal alloy analysis (including carbon.) Verichek employs a staff of qualified service engineers with over 150 years combined spectrometer experience. 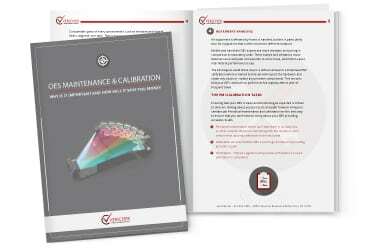 If you have a metals analysis question we have the answer for spectrometer sales, training, service and PMI Testing. For more information visit the FAQ page or the applications blog.